Check out this beautiful kitchen designed by interior designer Linda Engler! 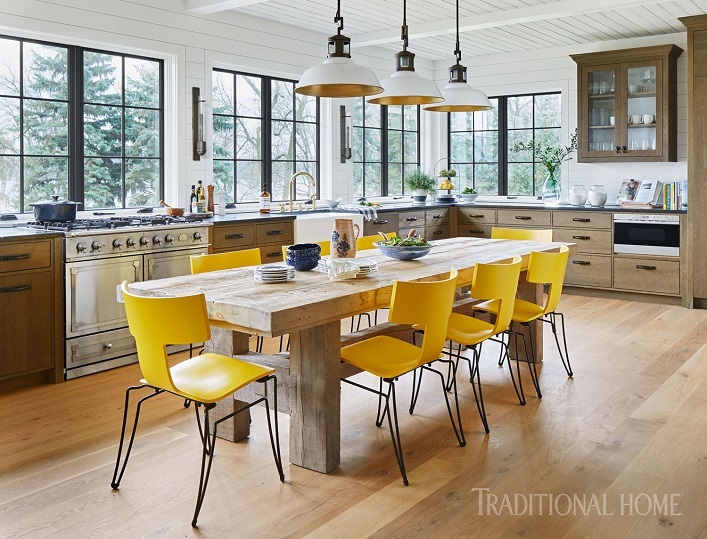 I like how the designer mixes a chunky reclaimed wood table with bright yellow modern dining chairs in lieu of a center island for an unexpected look. Industrial touches such as pendants and sconces provide a wonderful contrast against the warm stained-oak cabinets. Meanwhile, the expansive windows bring in an abundance of light into the space. Cheery, charming and eclectic, what's not to love about this visually interesting kitchen? What are your thoughts, my lovelies? Fantastic....Love the natural light and boy those yellow pops!!! Interesting. I have dear friends and the husband is a spectacular cook. They don't have a center island in their kitchen but a table, like in olden times. On limited counters and making a mess, he serves his delicious meals in the kitchen. One forgets the surroundings when great food and wine mix with great conversation. I'll always remember these meals as the best I've ever had--in the best surroundings. We have gotten so sterile and 'fashionable' that we forget eating as a primitive pleasure with good company.